This policy applies to website visitors, current and potential students, and any other user of services offered through St. George’s University (SGU) including any websites operated by or on its behalf. “We”, “us”, and “our” refer to St. George’s University. “Business Associates” means third party service providers which St. George’s University may contract with to provide services on our behalf including those related to the Sites or for transactions occurring on the Sites including, but not limited to, Social Networking, hosting, web analytics, Online Behavioral Advertising, lead generation, academic, business, career, or financial services. “Educational Partners” means St. George’s University and their subsidiaries and affiliates. “Site” or “Sites” means websites operated by or exclusively on behalf of St. George’s University, regardless of domain name or IP address. In addition to the Web Analytical Information automatically collected when you visit our Sites, St. George’s University also collects, uses, and discloses Personal Information that you provide to us voluntarily online or offline. Some examples include, but are not limited to, when you respond to an advertisement, a survey, or a request for information; register for classes; apply for financial aid; order educational or other products and services; set up a Social Network or other Site profile; or use one of our career resources, learning assessments or other interactive tools. The exact nature of the Personal Information may vary depending on the type of response or service requested. St. George’s University also uses Web Beacons (also known as clear gifs or pixel tags), which are images that we incorporate onto our Web site to analyze advertising campaigns and the general usage patterns of Web site visitors. 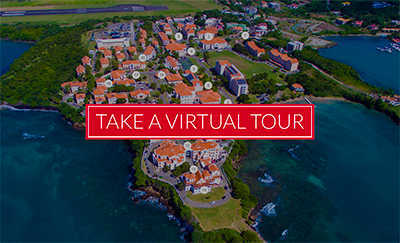 How does St. George’s University use these technologies? Browser Cookies: Browser cookies are used by St. George’s University and its partners for targeted marketing activities and Web site analytics. Browser cookies are placed on sgu.edu by us as well as third-parties. The information that we collect and share (e.g., IP Address of your computer and pages viewed) does not contain customer or consumer names, addresses, telephone numbers, or email addresses. This information helps our company refine and improve our Web site content and presentation, deliver relevant advertising regarding St. George’s University on other Web sites you visit and optimize our placement in search engine results. Flash Cookies: Flash cookies may be used by St. George’s University for limited purposes, such as authentication, as well as distinguishing customers from visitors to our Web site. Web Beacons: St. George’s University uses Web Beacons to help manage online advertising and site traffic analysis. These image files are provided by third parties for external ad management, search marketing tracking, affiliate marketing, and sgu.edu site analytics. In all such instances, the Web Beacon is programmed to collect your computer’s IP Address and certain other limited information when you are on our Web site. We do not collect your name, e-mail address, or telephone numbers using this technology. For example, with online advertising campaigns, Web Beacons enable third parties to recognize a cookie on your Web browser, which in turn enables us to learn which advertisements bring unique users to sgu.edu from other locations on the Web.